“She was like the Moon,” her mother replied. 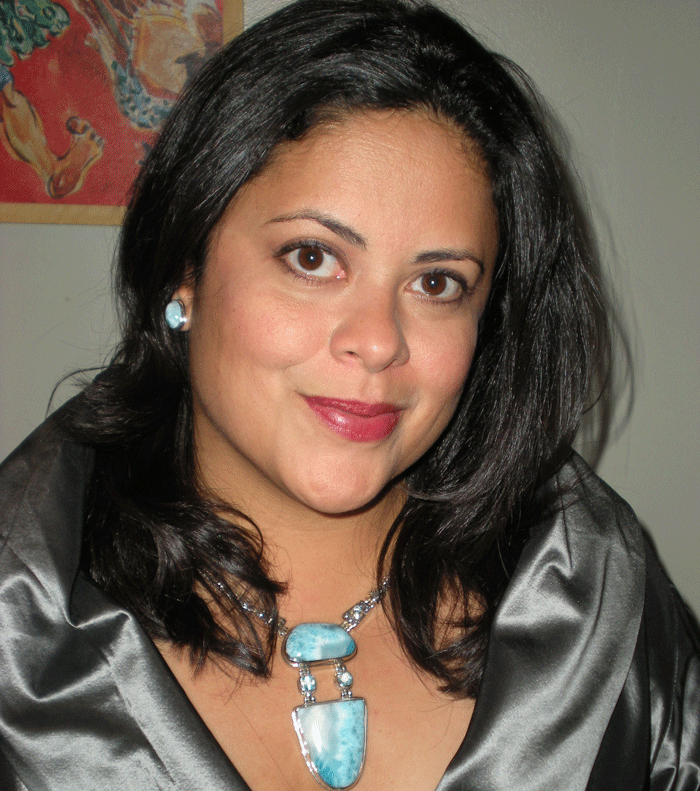 Maya Soetoro-Ng read these first lines from her new children’s book, Ladder to the Moon, her deep, melodious voice surrounding us as we finished our lunch at Book Passage in Corte Madera, California last week. 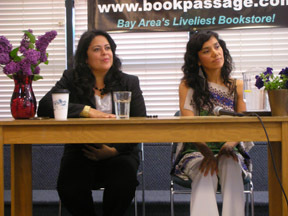 This was one of the final stops in the west coast leg of Maya’s book tour. I had the honor of sitting at the table with Maya and YuYi Morales, the book’s illustrator. Maya took the podium, gave a very brief preamble and professed to always feeling “like a tall woman in a short woman’s body”. Without missing a beat she then launched into a seamless mixture of reading and storytelling. I relaxed with my coffee and macaroon, knowing we were in good hands. As she spoke Maya flipped thorough the book showing YuYi’s illustrations. Author and illustrator shared the podium and had met for the first time only an hour before. Each spoke about being deeply connected from the start through this story they both felt compelled to tell; YuYi through her beguiling acrylic paintings sparked by Maya’s ethereal, lyrical words. Maya’s oldest daughter, Suhaila, six years old, is the namesake of the book’s heroine. 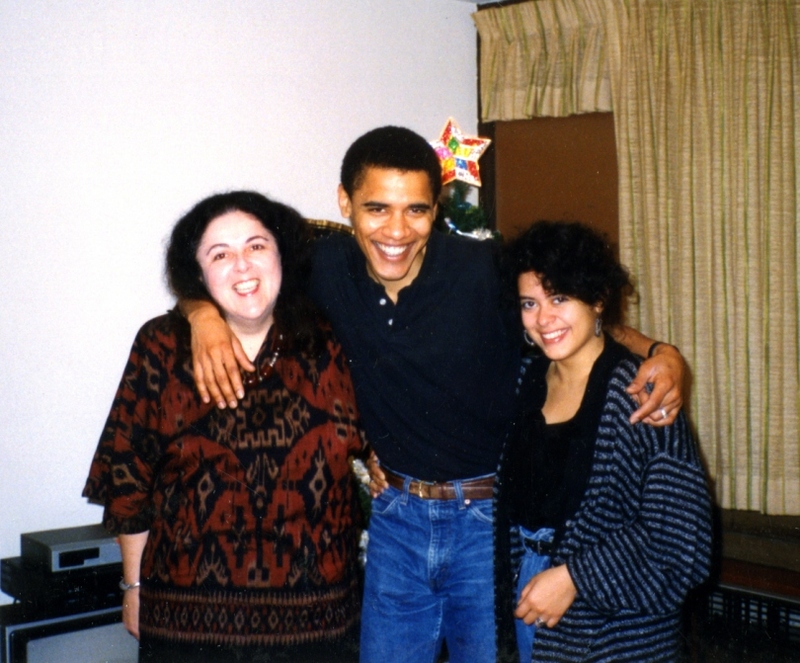 Her questions about Maya’s mother, Stanley Ann Dunham, were the inspiration for the book. Ann was 52 when she passed away a decade before Suhaila’s birth. In this magical tale Suhaila’s Grandma Annie descends a golden ladder outside her bedroom window and leads her up to the moon on an adventure of healing, helping and growth. Stanley Ann Dunham earned a PhD in anthropology from the University of Hawaii. In 2009 Duke University Press published her dissertation posthumously under the title, Surviving Against the Odds: Village Industry in Indonesia. Maya told of a photo—included in this book—taken in Indonesia showing Ann dressed in batik, sitting before a basket of chicks, with a duckling in her hands. This photo bespeaks Suhaila’s profound connection to Ann, apparent in their shared love of critters, large and small, “Suhaila is the resident activist in our building, protecting slugs, beetles and worms with a tremendous reserve of affection inherited from my mom.” Maya admitted to her need to draw the line at the idea of relocating cockroaches. 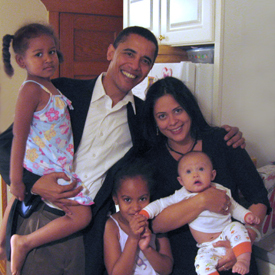 The book also reflects Maya’s own life journey, which began in her birthplace, Jakarta, Indonesia, where she and her older brother, President Barack Obama, spent a large part of their very multicultural childhood. After mentioning at the table that we homeschooled our daughter, I learned that Ann also homeschooled Maya, instilling in her a fierce love of learning and to value the best of the past. 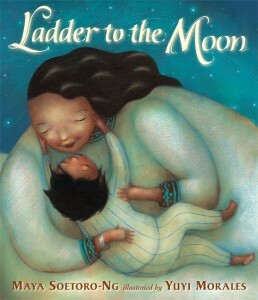 Ladder to the Moon artfully enfolds many complex themes ~ the interconnectedness of us all, healing from loss, and the pragmatic value of building bridges. These also radiate through Maya’s work as an educator. With a PhD in international comparative education, she has taught middle school, high school and at the University level for many years. Maya wonders what lessons her daughters might have learned from their grandmother if they could have met her. Indeed, Ladder to the Moon is a beautiful answer to that question.